Greetings friends! Have you missed me? I’ve been out and about with family recently. I grew up enjoying weekly “Day Trips”. As a child my family usually took us to see extended family. 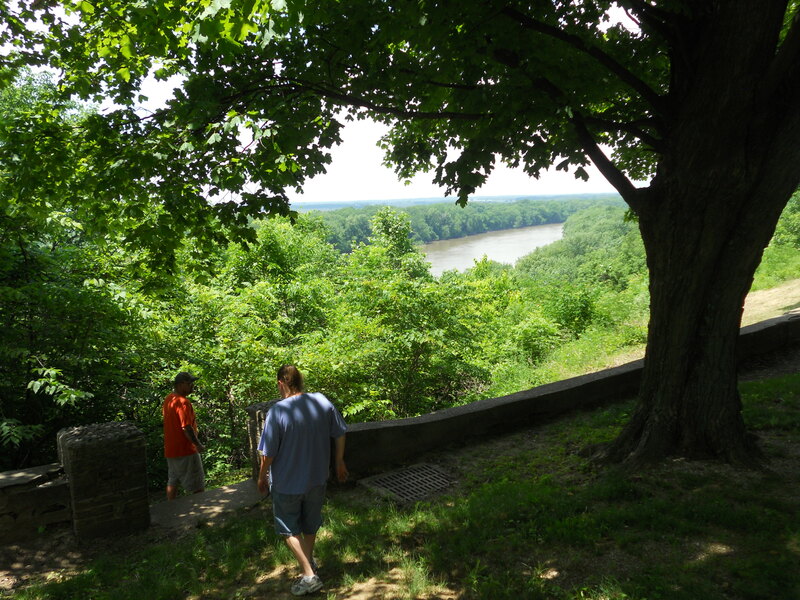 Sometimes we would spend an entire day picnicking and hiking at any number of state parks within a two hour drive. A few times dad would drive even farther to an amusement park or a special zoo attraction. After I became an adult I continued this tradition with my girls. And now that my girls are grown, they are continuing our family tradition with their friends and family. Recently I was treated to one such outing by my oldest and her fella. 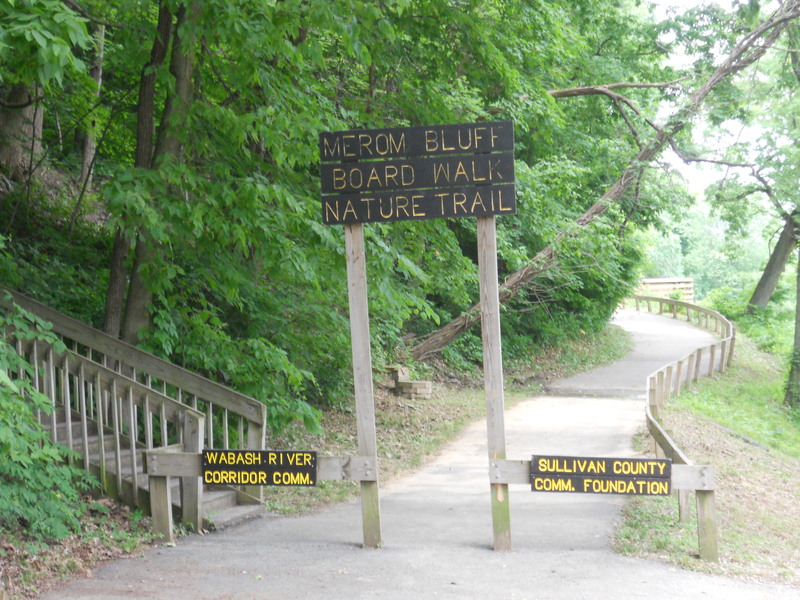 Travelling a bit closer to home, we visited Merom, Indiana, and the park known by locals as “Merom Bluffs”. 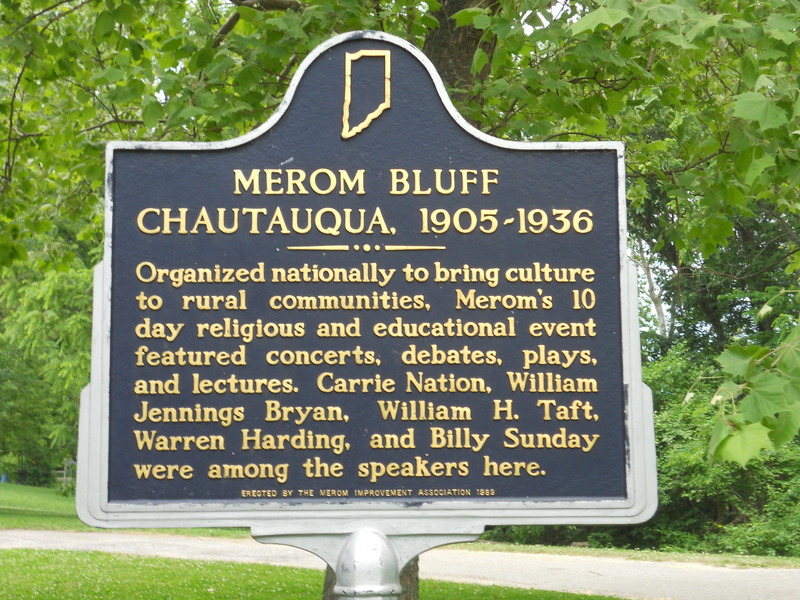 There are numerous historical signs like this all around the area. 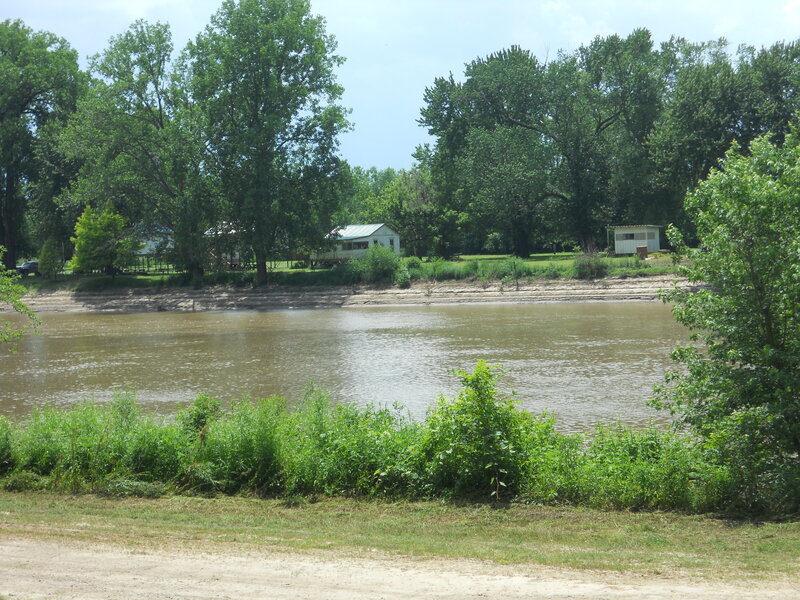 Merom sits on the banks of the Wabash River. It is rich in American Indian history, Christian history, and, as you can see, cultural and even political history! 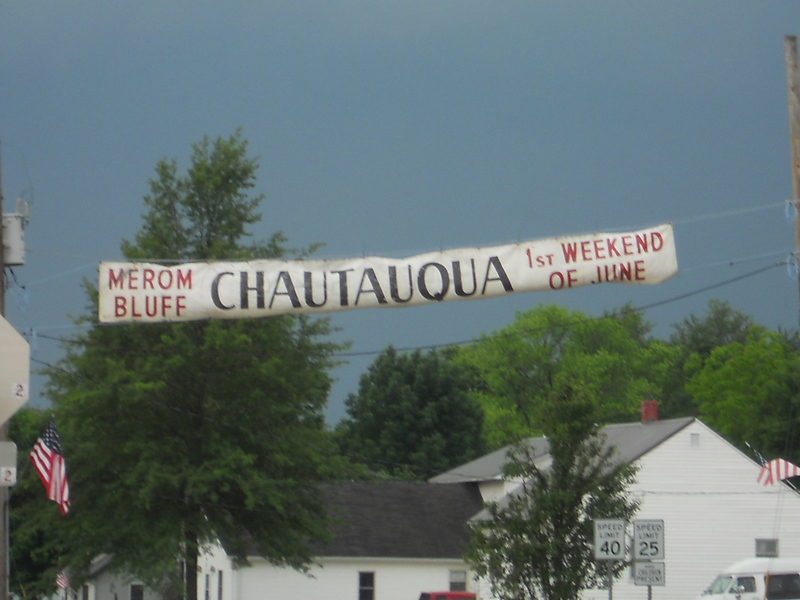 The 10 day Chautauqua festival has since been whittled down to a weekend event. We showed up prior to the event. 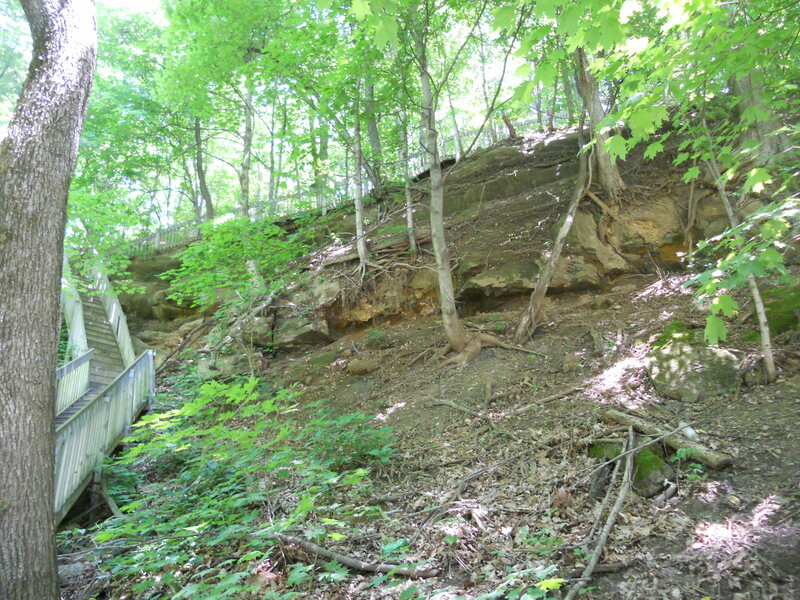 We considered this entry point to the bluff. It was quite broken down so we decided to take another route. The tree in the right of the last photo is the same one seen at the top and left of this one. 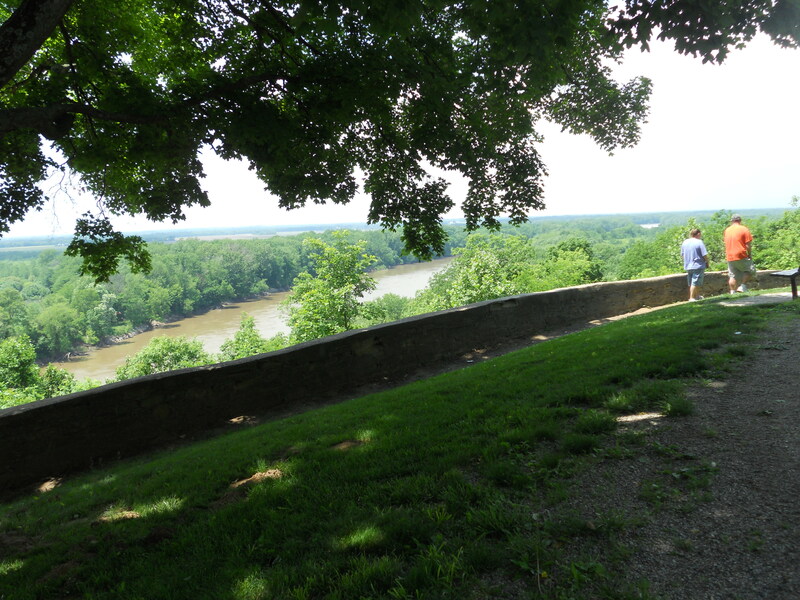 That’s the Wabash River in the distance and Illinois just beyond that. This photo is looking slightly north-north west. This is about the center of the wall. I tried really hard to get a good picture of the horizon. I could barely see the stacks at the refinery in my town. Not as the crow flies (because I’m no crow) the distance is well over thirty miles to the horizon. Probably a bit more like forty. As you can see, the sun is shining but it’s also cloudy/hazy. You will notice in the next few pix there is a storm rolling in…If you look really hard you will notice a building just to the center left in this photo above. I will show you the same building in a bit. 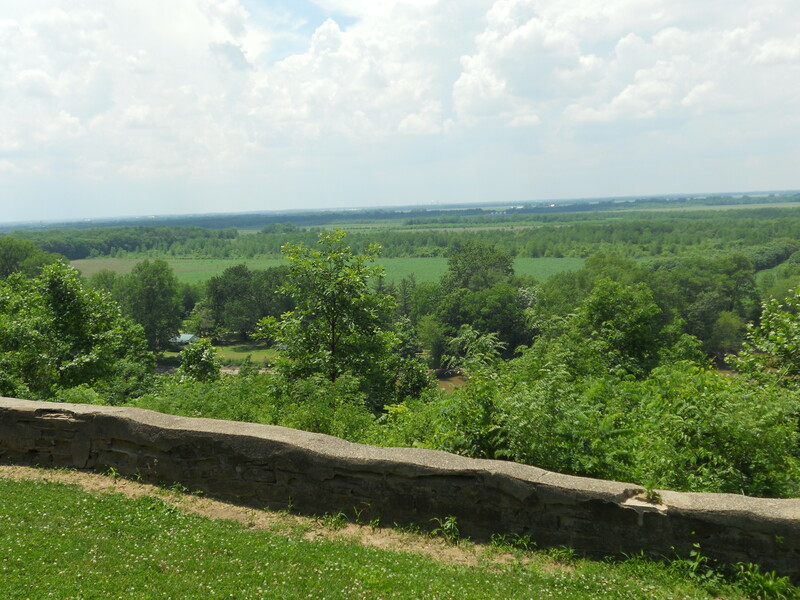 Here’s a view back to the south along the wall. 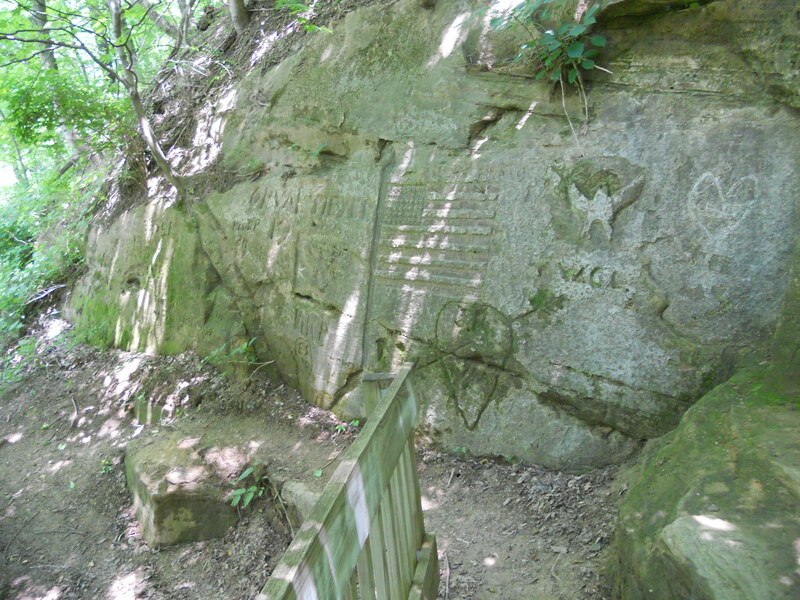 I had forgotten but this was a military wall during the civil war!!! 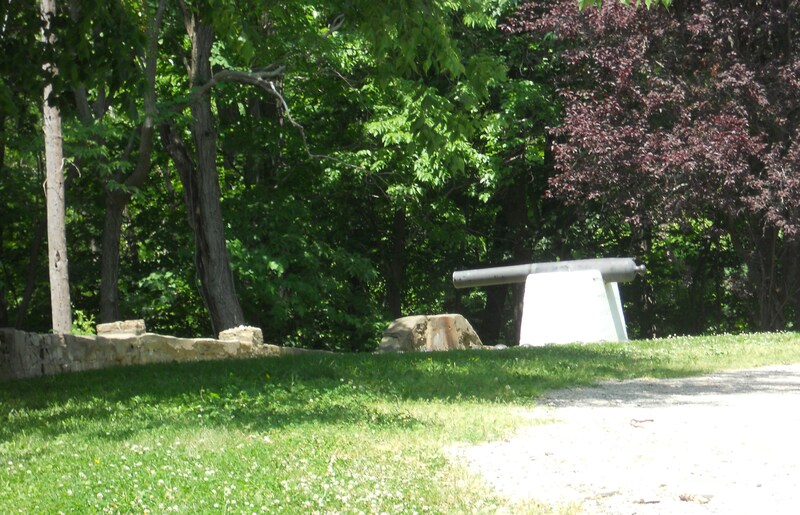 One of the original cannons! It’s actually a pretty good walk to see this too. I had to use zoom just to see it this well. 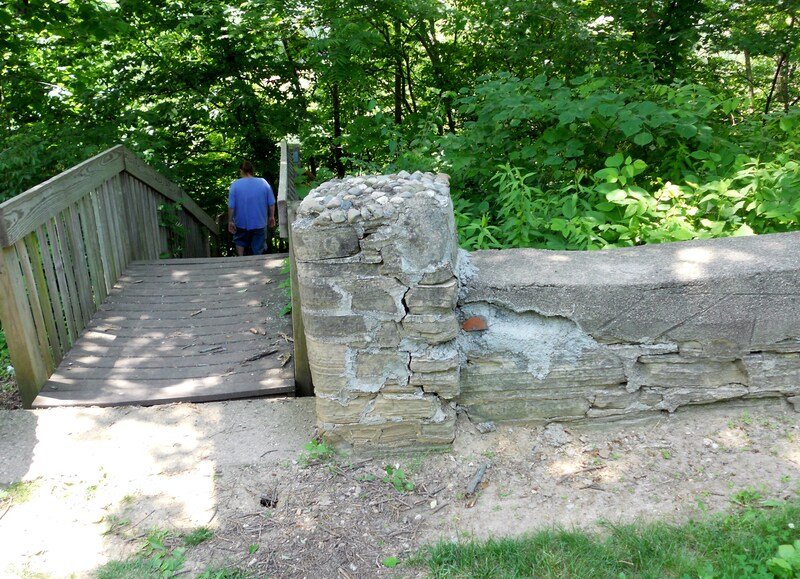 And FINALLY, we find a relatively new bridge and trail! This had never been here in times past for my visits. And so here begins a hike downwards to the river. 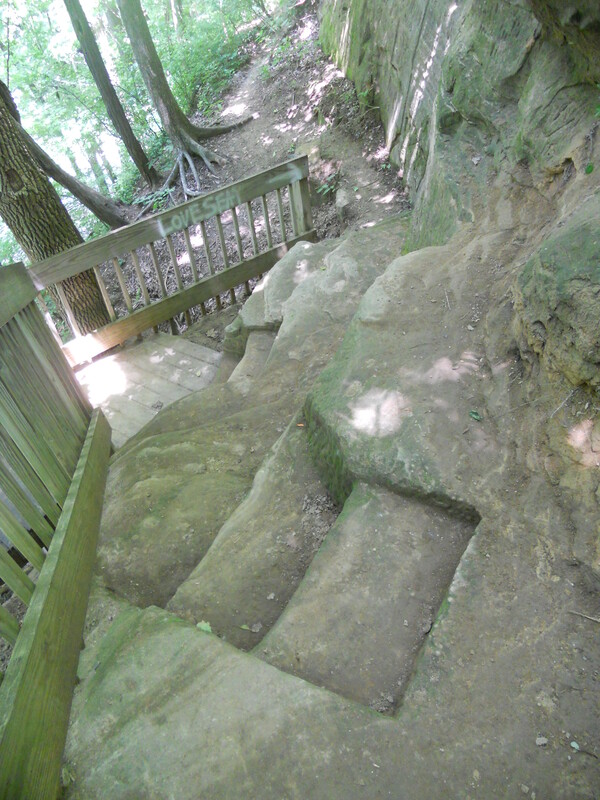 I will share several pix to show how steep this hike was for me. Doesn’t look so bad yet? Alrighty then…I DARE you! 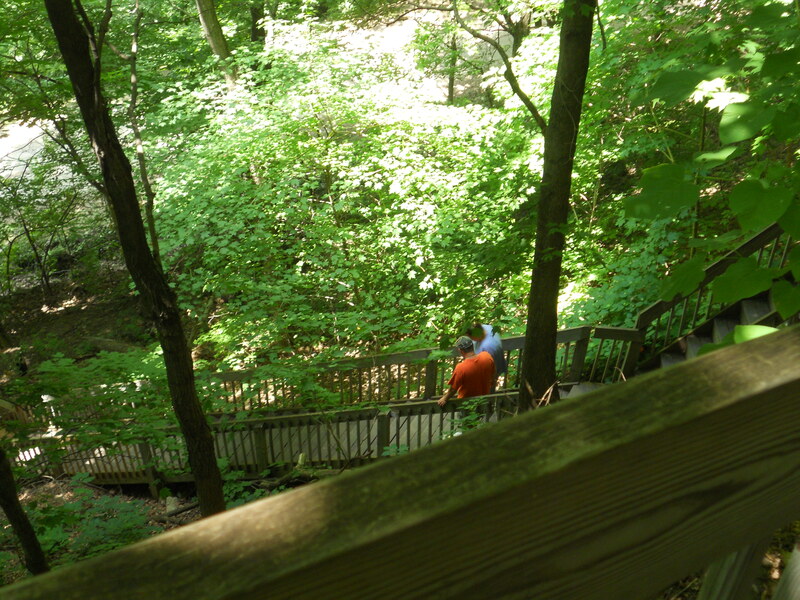 Well, well…hmmm….and this isn’t even the steepest part! 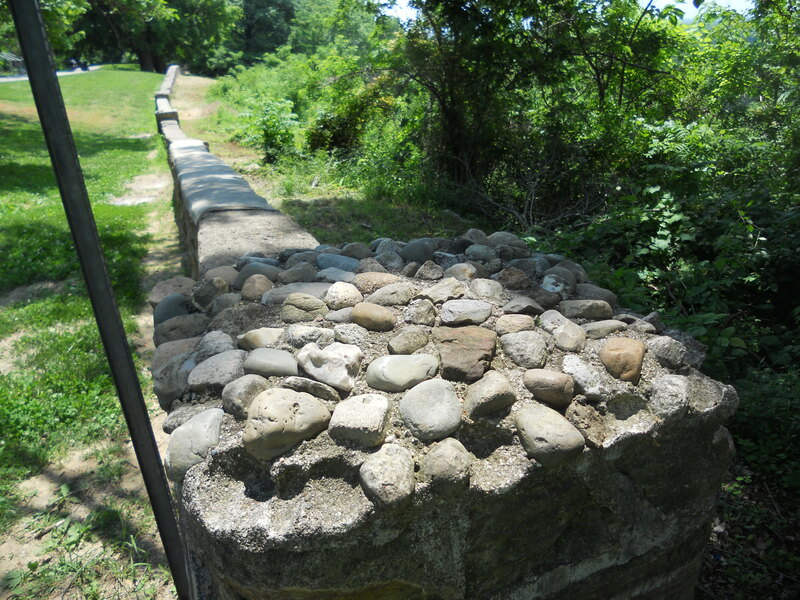 Here is evidence that some form of this trail dates back an incredibly long time! Rock carvings! Yeah, some is “new” but you could also see evidence of some very well worn carvings too. I’m going to guess that this is at the halfway point. Looking back up into the dizzy view. Still on the trail. the stairs rather disappear into the upper right of this photo. HAHAHA!!! 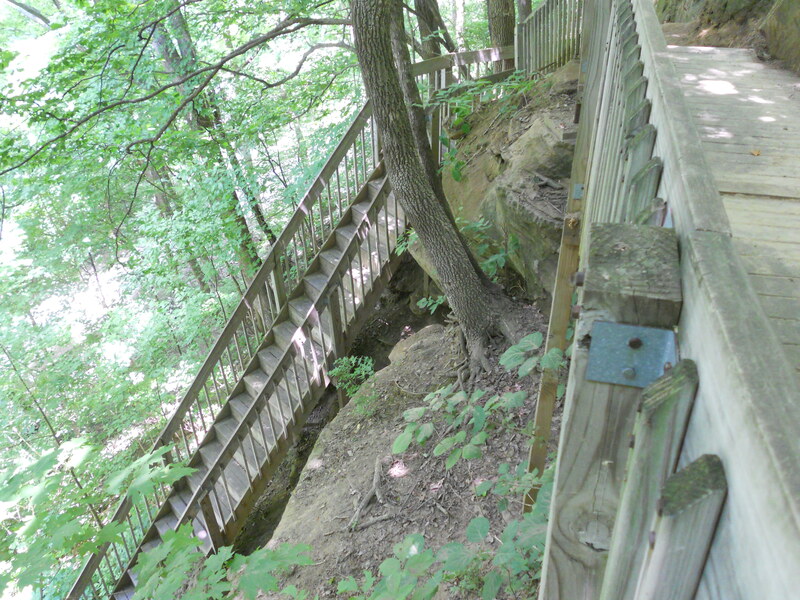 The stairs on the left here only go to a shelter house with a picnic table! Where we came out was in the far distance! 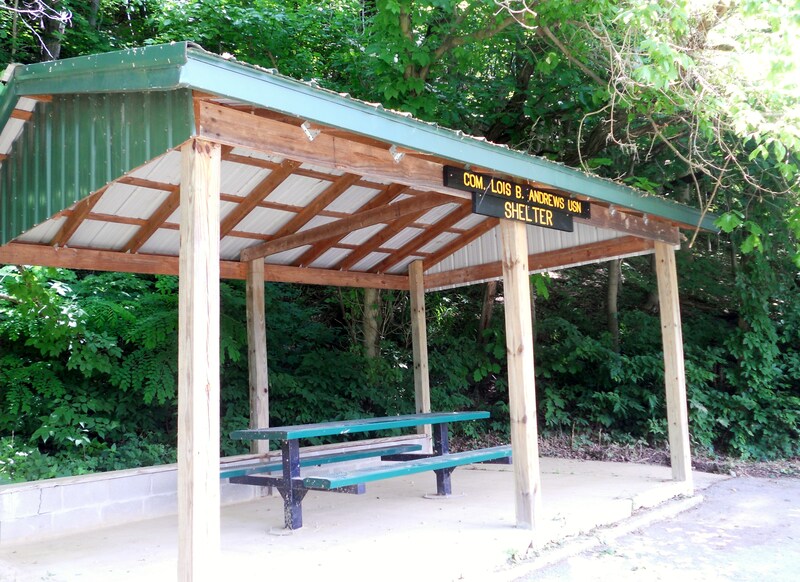 This shelter sat a bit closer to the actual ground! After regaining ourselves a bit we drove back around town to the only other attraction. 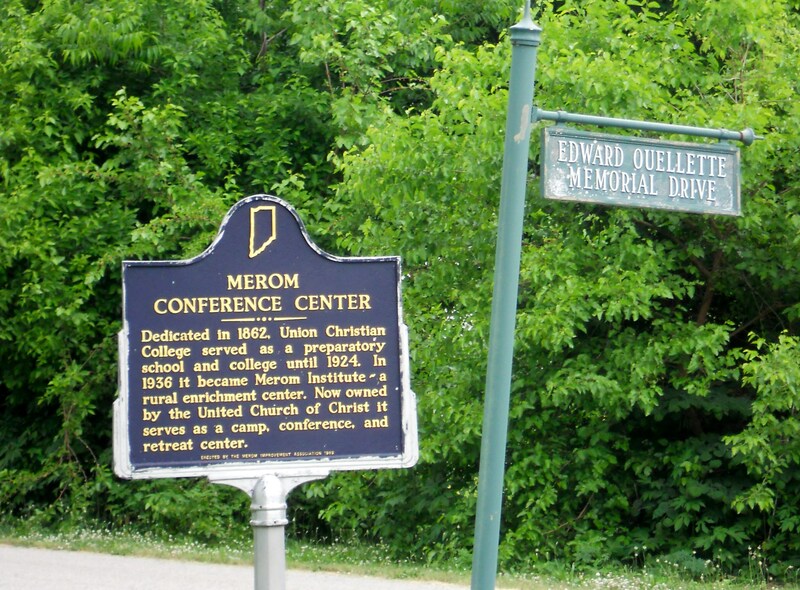 I thought this history sign was placed rather close to the street sign. Made for an interesting photo, wouldn’t you say? And when I turned around while standing pretty much in the same spot I photographed the BIG sign. 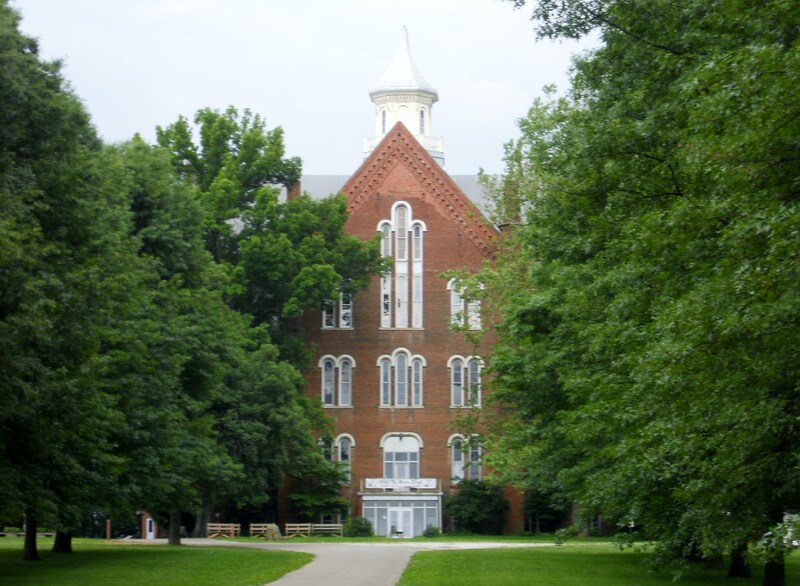 I dare say there weren’t many Christian colleges in 1859! AND now, just to the right of this sign is the triumphant LONG lane that frames the main college building. Those are glassed in doors at the bottom front. 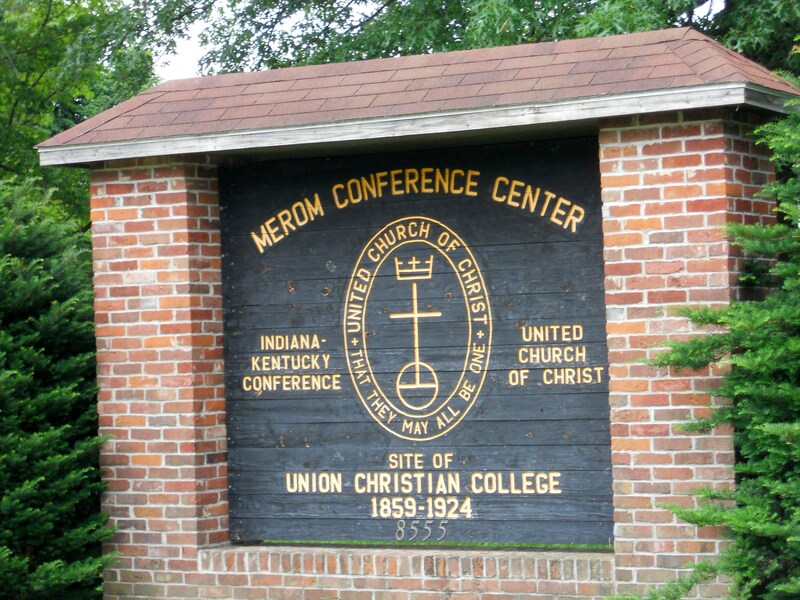 Until recently the building had been vacant and vandalized. There was a news story about this building and it’s bell tower on one of our local (CBS) news stations prior to these doors being built. Fascinating interior. Alas, there’s no evidence of tours. One last view. Very picturesque. 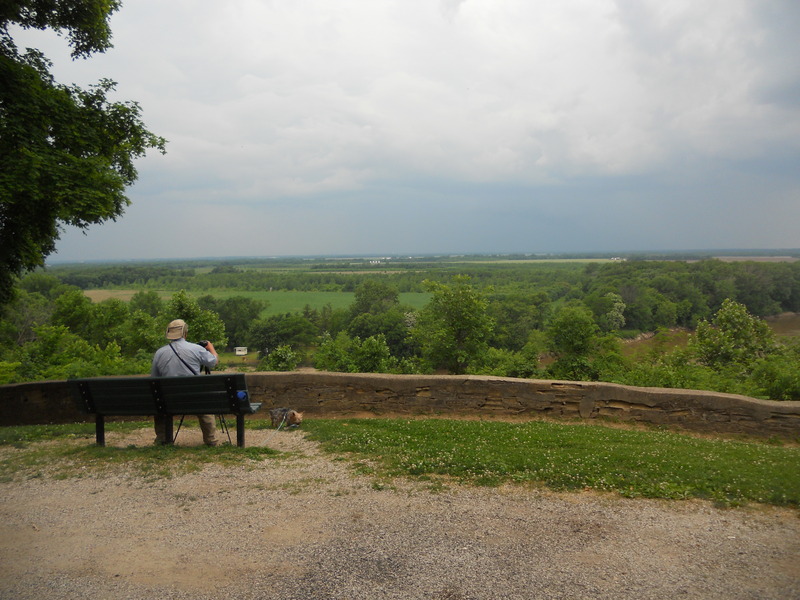 This older gentleman was taking some finer photographs than I have capability. There’s that building across the river again. And the storm looming in the sky just to the right of the photo hits us as we leave for home.